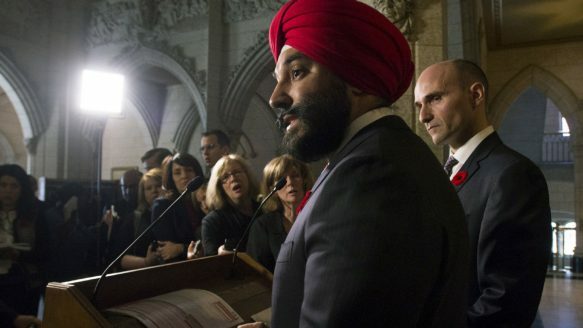 Navdeep Bains, minister of innovation, science and economic development said Friday in a statement that the country's scientists were free to speak with media about their projects. The muzzles are coming off for federal scientists. For years, scientists who worked for the federal government were silenced by strict rules that made them seek departmental approval before speaking to the press. On Friday, Minister of Innovation, Science and Economic Development Navdeep Bains said that scientists are free to speak to the media about their work. “Our government values science and will treat scientists with respect. That is why government scientists and experts will be able to speak freely about their work to the media and the public,” he said in a statement provided by his staff. The change in policy is being communicated across departments and ministries in the government. On Thursday, scientists at the Department of Fisheries and Oceans were told they were now free to talk to the media, said David Prince, director at the Canadian Hydrographic Service. The news was conveyed during a scheduled staff meeting and Prince said the response in the room from the scientists was positive. “Scientists look forward to talking about their science, so it was welcome,” he said. The DFO was not immediately available for comment. A spokesperson for Environment Canada said the government made it clear that scientists can speak to the media about their work, and that departmental policies and procedures would be revised to formally implement this direction. Staff were given general directions about how and when to speak to the media, Prince said. “Stick to the science, don’t talk about things you’re not an expert in,” he said. Prime Minister Justin Trudeau made freeing scientists part of his larger campaign pledge to open up government to the public and improve relations with the civil service. On Wednesday, Trudeau sent top diplomats a letter telling them he would rely on their expertise. “You are experienced, skilled professionals, and some of Canada’s best assets internationally. Under my leadership, you will have a government that believes in you and will support you in your work around the world,” the letter read. Trudeau was greeted by a mob of giddy civil servants eager to snap selfies with the prime minister Friday at the Lester B. Pearson building in downtown Ottawa.